Woodhill Park01263 512242work Holiday, Touring & Camping Park (SC)Located in a breathtaking clifftop location, Woodhill Park has magnificent views of the coastline and surrounding countryside. 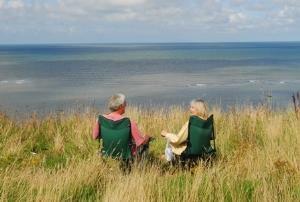 It’s the ideal spot to sit back, relax and take in the inspiring natural landscape. Woodhill Park has everything you’d expect to make your stay enjoyable and comfortable. On site we have a small shop and launderette and our large recreation field and crazy golf. We also have a play area which has a sandpit, swings and assault course ...we even have a giant chess and draughts board! Seashell Events are held during the main holiday periods giving children and families the opportunity to enjoy activities that are linked to the natural environment. The park is an ideal base from which to explore all of the natural and man-made attractions to be found in the beautiful and unspoilt county of Norfolk. And at the end of the day, you can return to the peaceful surroundings and comfort of Woodhill Park. Our Luxury range of holiday homes has a high standard of quality and attention to detail that makes all the difference when you’re away from home. The Cromer is a 2 bedroom home sleeping up to 4 people and the Sheringham a 3 bedroom home sleeping up to 6 people. Each of our Classic Accommodation has unobstructed sea views and the most sumptuous of interiors, helping you to relax and unwind. The Felbrigg is a 2 bedroom home sleeping up to 4 people. • Unobstructed sea views • Central heating system • uPVC double glazing • Spacious well furnished lounge, including two free standing armchairs • Fully fitted kitchen with microwave oven, gas oven/hob, fridge freezer and toaster • Separate dining area • Colour television, DVD player and radio • Shower room, w.c. • Outside barbecue and seating • Electricity and gas included in tariff • The master bedroom has a second television • The Felbrigg master bedroom has an en suite w.c. Visitors are also able to bring their own touring caravan or tent. On the A149 between Cromer and Sheringham at East Runton.